When playing this interactive 2nd Grade Vocabulary Game, elementary students will practice important math vocabulary terms that are part of the 2nd grade math curriculum in many states. For each word, kids will have up to 60 seconds to type the correct math term for each given definition. Most vocabulary words have an illustration or an example. This game can be played on computers, iPads, and other tablets. You do not need to install an app to play this game on the iPad. 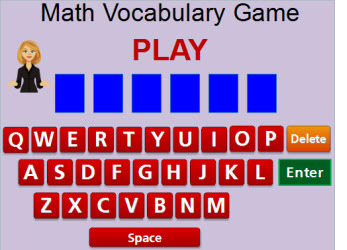 Return from the 2nd Grade Vocabulary Game to the 2nd Grade Math Games webpage, or to Math Play.